DREAM AHEAD (USA) (Bay or Brown 2008-Stud 2012). 6 wins-3 at 2, Newmarket July Cup, Gr.1. Sire of 481 rnrs, 257 wnrs, 21 SW, inc. Al Wukair (Deauville Prix Jacques le Marois, Gr.1), Donjuan Triumphant, Shumookh, Dark Vision, Tornibush, Dreams Aplenty, Sweety Dream, Final Frontier, Basileus, Gold Tail, Mozart, Pursuing the Dream, Dream of Dreams, Gorane, Peach Melba, Sensei, Tisbutadream, Visionary, Awaken, Generalissimo, Ken's Dream, etc. Ten Foot Tall (f. by I Am Invincible). Winner at 1000m in 2018-19 in Aust. LUVYA BABE, by Soviet Star. 2 wins at 1200m, 1300m, 3d ARC International Airport H., Rotorua RC Dennis Hanson Motors H. Half-sister to BALLROOM BABE (dam of JUST DANCING, TAHNI GIRL, HIDDEN DRAGON), Triumvirate. Dam of 3 named foals, 2 to race. Ideal Guide (Red Ransom). 6 wins-1 at 2-from 1350m to 1600m, A$68,500, 38,269Rgt., S$243,135, to 2018 in Aust., Malaysia and Singapore, Singapore TC Arenti S., 2d ATC Schweppervescence H., Gr.3, Centrebet Juvenile Stayer H.
MASCHINO (Encosta de Lago). 7 wins from 1300m to 1800m, A$273,700, WATC RJ Peters S., Gr.3, B&T Watson H., Wild Turkey Bourbon Give Em the Bird H., Mary McGinnis Best Mum H., 2d WATC Asian Beau S., Gr.3, 3d WATC Northerly S., L. Sire. KENTUCKY BREEZE (Pierro). 3 wins from 1100m to 1600m, A$173,300, to 2018-19, VRC Emirates Airline H., L, Ballarat TC Suez McKellar Mile H., 2d VRC Employee Volunteer H.
Tahni Dancer (Sebring). Winner at 1200m, A$142,190, 2d Moonee Valley Fillies Classic, Gr.2, MVRC Champagne S., Gr.3, 4th Scone RC Inglis Guineas, RL. Dee Bee Nine (Red Ransom). 8 wins to 1400m, A$287,265, MVRC Slickpix H., BRC Kirin H., 3d Oakbank S., L.
HIDDEN DRAGON (Danehill). 6 wins-1 at 2-to 1400m, HK$7,483,500, HKJC Chinese Club Challenge Cup, L, Lek Yuen H., Ho Sheung Heung H., 2d HKJC Stewards' Cup, L, 3d HKJC Sha Tin Trophy, L. Sire. Into Orbit (Northern Meteor). 2 wins at 1000m, 1100m, A$82,250, MRC Bigscreencompany.com.au H., 2d MRC Manfred S., Gr.3, 4th MRC Zeditave S., Gr.3. FENCE POSTWAL - SHANTOU MAYOR (Mal.) (Montjeu). 5 wins-2 at 2-from 1300m to 1700m, A$20,400, 841,215Rgt. in Aust. 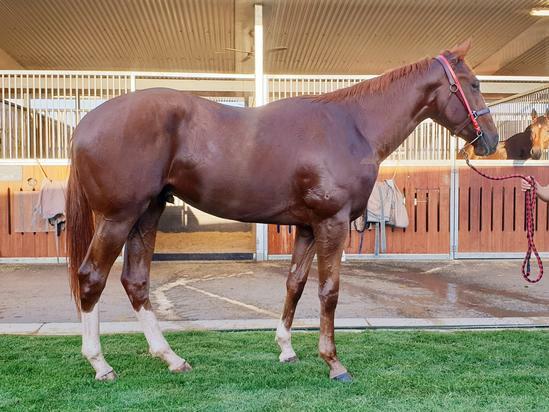 and Malaysia, Selangor Gold Cup, L, WATC Fremantle Legacy 2YO H., Kalgoorlie City Football Club 2YO H., 2d Penang TC Yang di Pertua Negeri Gold Cup, L.
POLANSKI (Rakti). Top of 2013-14 Australasian 3YO Classification (Long & Extended). 4 wins-1 at 2-from 1450m to 2500m, A$1,173,565, Victoria Derby, Gr.1, MRC Norman Robinson S., Gr.3, VRC UCI S., L, MRC Routley's 2YO H. Sire. Citiman. 2 wins at 2000m, 2100m, ARC Orient Lines H., 2d ARC Anton's Seafood H., Tosco H., BOP RC Tauranga Canvas Company H.
Silk Spur (Rusty Spur). 3 wins-2 at 2-to 1150m, Wanganui JC Ford 2YO S., 2d WRC Wellesley S., L, 4th Whangarei RC Northland Breeders' S., L. Producer.